It has been shown in Chap. 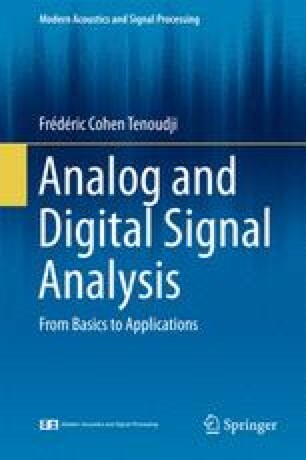 12 on time-frequency analysis that how decomposition on a wavelet basis allows highlighting effectively changes with time of the properties of a signal. Wavelet bases with compact support, which could be used by simple filtering operations, have been searched. These bases must also allow reconstructing the signal accurately and easily from the decomposition coefficients. It is known that the details of a signal are contained in the high frequencies and the general shape in the low frequency content. Hence, the idea to separate information contained in high and low frequencies. The progress of the analysis of filter banks led to multiresolution analysis. It allows numerical separation of frequency bands recursively while still allowing the ability to reconstruct the signal without loss of information in a second step. The presentation of these concepts in this chapter begins with the principles of the dyadic decomposition-reconstruction of a signal. The initial Haar Transform mathematical developments are given as an example. Their understanding makes it easier to address the concepts of multi-resolution analysis. Mallat theorem is given, and the development of a function on Daubechies wavelets detailed.